Weak Q2 results and a sharp guidance cut sent the stock to multi-year lows. The billionaire CEO's "life partner" (the company’s Co-Chief Operating Officer) is buying the stock. The valuation and total return potential look compelling. Whenever a reliable dividend payer gets hammered, that stock deserves my attention. 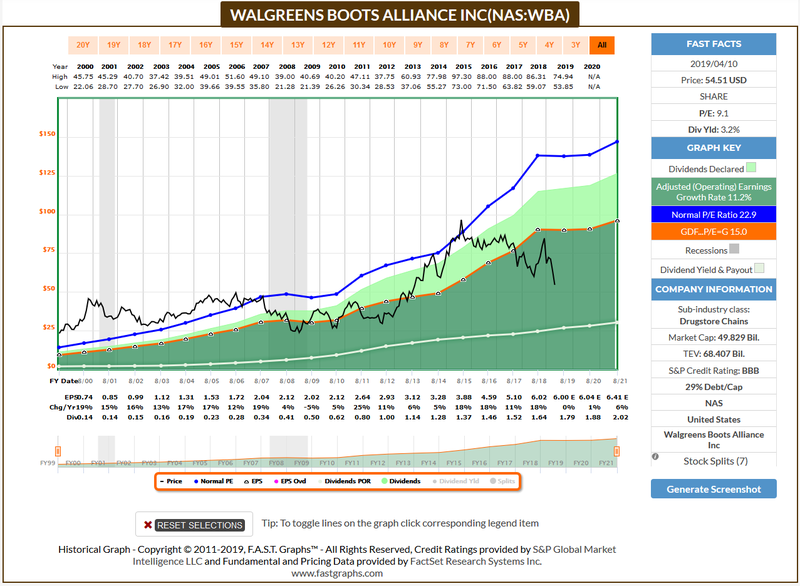 Walgreens (WBA) is a Dividend Champion with a 43-year dividend-raising streak, and its shares trade at multi-year lows after the company disappointed with its Q2 results and announced a sharp guidance cut. 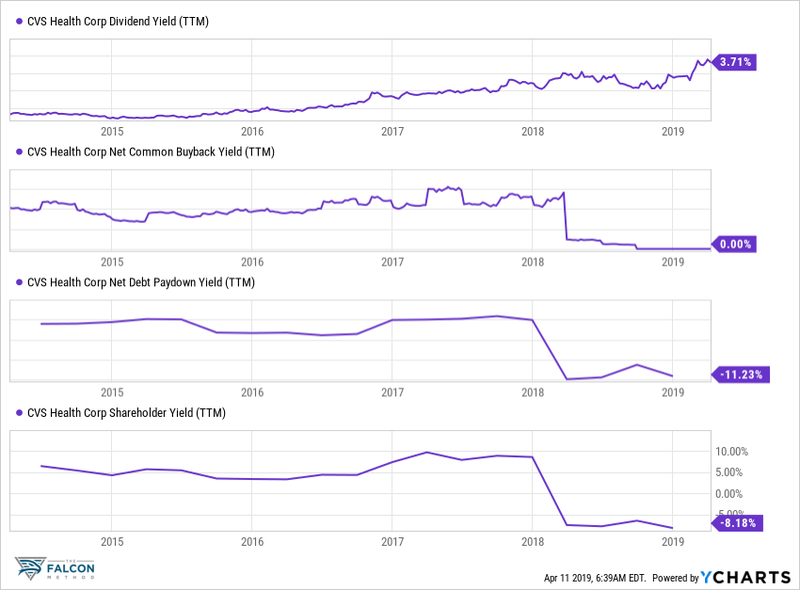 The full-year guidance was slashed from 7% to 12% growth all the way down to just flat on a constant-currency basis, and Wall Street was quick to hand out the punishment. Short-termism breeds opportunities for long-term investors, so it is time to have a look at where the valuation stands and whether the fundamentals are intact. Is the valuation attractive enough to take a closer look? I always examine the valuation from several different perspectives. 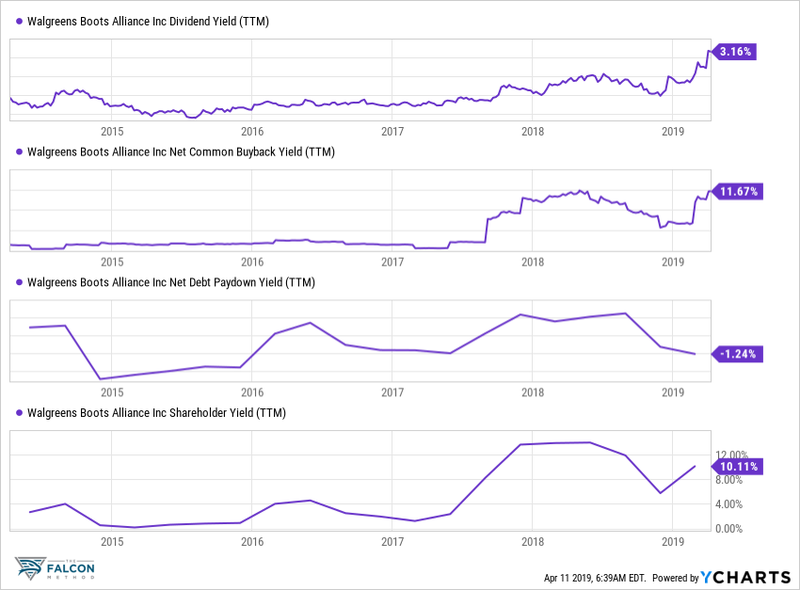 With a Dividend Champion like Walgreens, it's hard to miss that this stock has hardly ever offered an entry yield of today's magnitude. Payout ratios are healthy; the safety of the dividend is unquestionable. 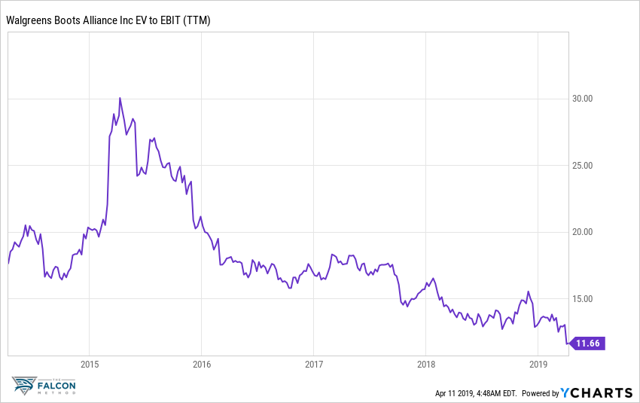 Back to the valuation, the EV/EBIT multiple sits at a five-year low. Looking at the chart from FAST Graphs also shows that the current valuation is out of the historical range (I examined different time frames and came to the same conclusion). All in all, the valuation looks attractive enough to take a closer look. You may ask yourself at this point: what is already priced in with the stock trading at such depressed valuation multiples? For me, it seems that it will be easier for Walgreens to surprise on the upside from here; thus the stock qualifies as a selective contrarian opportunity that is worth examining further. With Walgreens, we have a billionaire CEO who owns about 15% of the company, and thus 15 cents of every dollar spent is his. It's no surprise that he is not rushing to make overpriced acquisitions, but repurchasing shares instead. 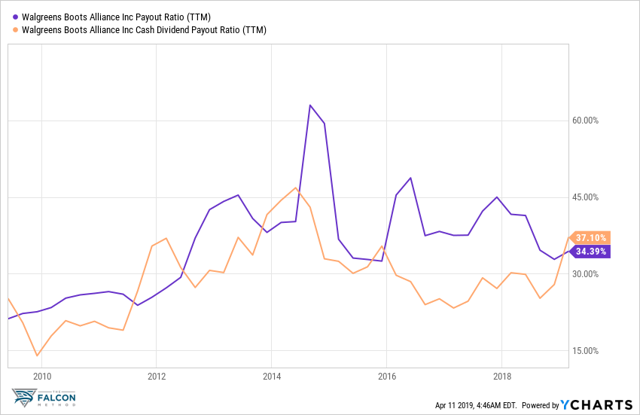 When he says that the business model is not broken and the company will be capable of delivering sustainable adjusted EPS growth of mid- to high-single digits beyond 2020, we should listen. As long as we are ready to believe that the business model is not broken, the current valuation makes no sense. Maybe Pessina's "life partner" Ornella Barra thinks the same as she bought 18,000 shares at $54.56 after the quarterly report came out. What total return can we reasonably expect? I tend to be overly conservative when I come to this point in the analysis. In fact, my margin of safety comes from three different sources. First, I assume that the company will miss estimates even if the analyst scorecard looks decent in FAST Graphs. Second, I assume that the stock will trade at an even lower multiple than the one that FAST Graphs shows as the most depressed level historically. Third, as a result of the calculation, I'd like to see a potential annualized total return figure that is higher than my expected minimum threshold even with the former conditions met. Let's see where this takes us with Walgreens. 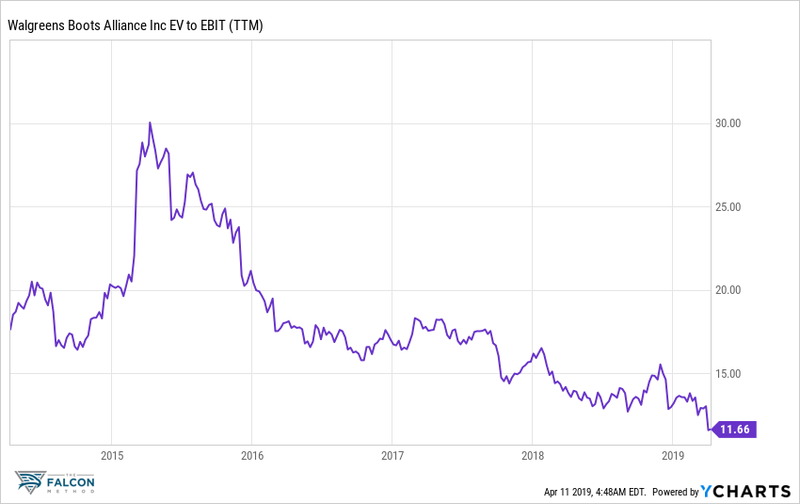 I don't think that anyone who had a closer look at this stock's historical valuation and the accuracy of the analysts' estimates could accuse me of being overly optimistic with the assumptions reflected on the chart, yet the annualized total return is almost 20%. (That's what I meant by the third source of margin of safety). It's almost impossible to come up with a calculation that would render the stock uninvestable at these price levels as long as you believe that the company has a sustainable business model. Truth be told, this is a valuation play. 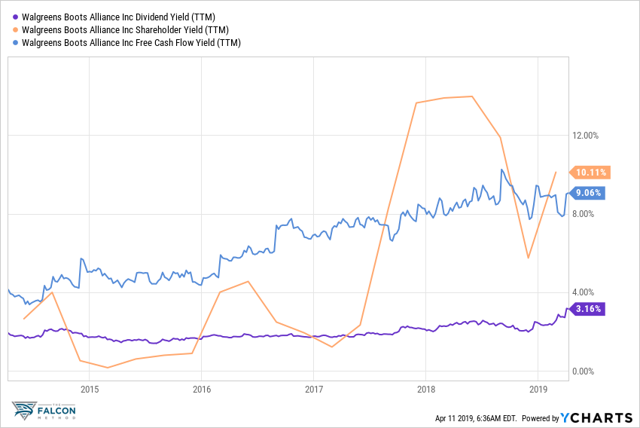 The dividend yield is far from sky-high, the growth rates are not that stellar, but the valuation multiple has room to expand once the market's perception of the firm's future changes. It's always a good idea to dissect the total return equation and see which components could drive our returns (Different types of opportunities appeal to different kinds of investors). It's time to see how the stock fares according to the FALCON Method! Let's employ the FALCON Method to see how Walgreens ranks within this structured decision-making framework that is built on evidence-based steps. (The FALCON Method is a stock selection process that serves the construction of a buy-and-hold portfolio with both an income and total return focus. The model is about 90% quantitative and 10% qualitative). The process includes the following steps. Step 1: Narrow down the field of stocks. I focus on a group of stocks that tend to outperform according to historical data. 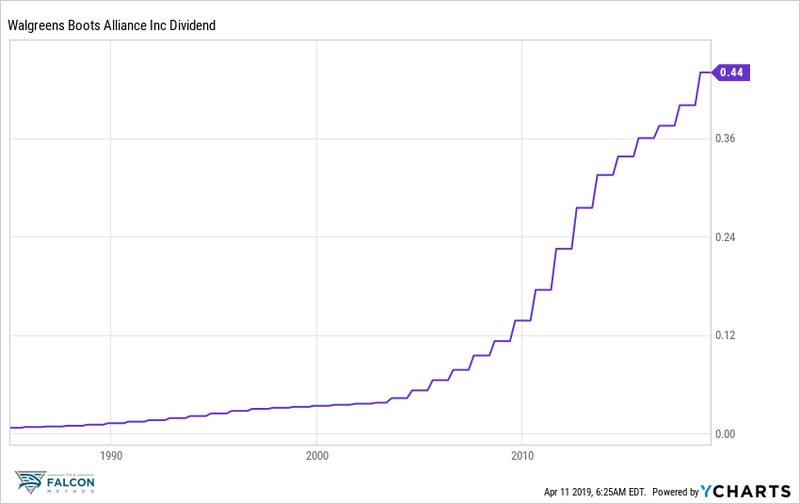 My minimum requirement is 20 years of immaculate dividend history, meaning there are no dividend cuts within this period. With its Dividend Champion status and the 43-year dividend-raising streak, Walgreens PASSES this test easily and can safely be classified as a reliable dividend raiser. Step 2: Check the valuation. 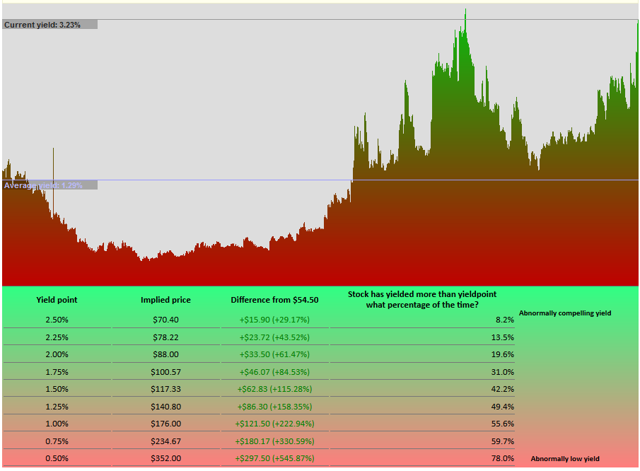 I focus on the stocks that seem to be undervalued historically based on various metrics. These numbers reinforce my opinion that Walgreens is valued attractively in historical comparison, so the stock PASSES the test of valuation. Step 3: Three hurdles to filter them. I use absolute threshold criteria (dividend yield, free cash flow yield, and shareholder yield) to determine whether a stock is good enough to invest my capital or I should pass up the opportunity. 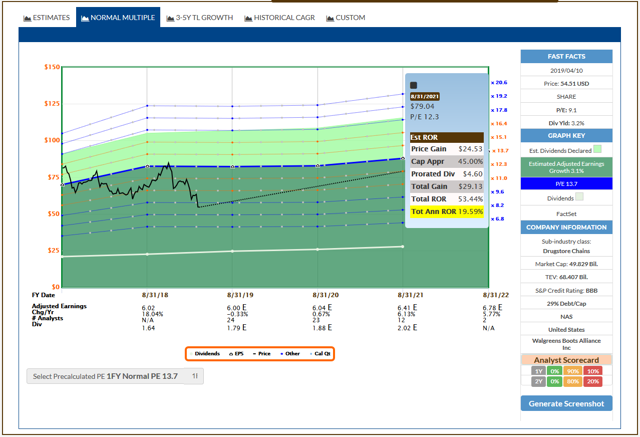 I deliberately define low limits with all the three indicators, since my experience shows that meeting all three low requirements together usually disqualifies a very large chunk of stocks on my list, but leaves just enough of them to continue the analysis. So this is a very tough combined filter in spite of seeming to be a bit lenient on the individual factors. Walgreens PASSES here. 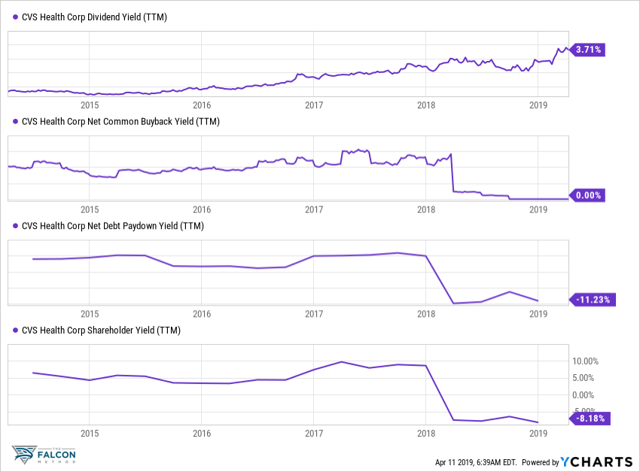 As to the shareholder yield, further examining its three components gives us a clearer view of the shareholder returns. Step 4: Rank the survivors. I am using a multifactor quantitative ranking, the factors of which are mostly Chowder-like numbers of different time frames. Walgreens' stock didn't make the Top 10 of the most recent FALCON Method newsletter (published on 7th April). The stock ranked 16th to be more exact, but it was still named as a top pick based on subjective qualitative assessment. Step 5: Enter the human. This step involves some qualitative judgment, but it is far from a Buffett-like deep analysis since not too many of us can carry that out at such a level and with that kind of confidence. As this is the most labor-intensive part of the process, I only spend time on this with the stocks that look promising candidates for my portfolio. 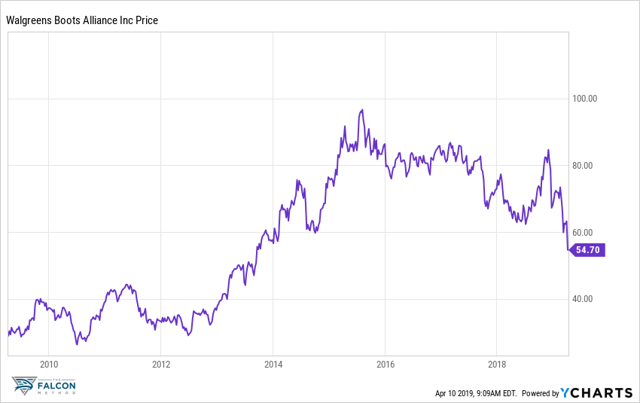 I believe that Walgreens will stay relevant thus the current valuation makes no sense. I don't consider Amazon's (NASDAQ:AMZN) entrance into the retail pharmacy business a lethal threat since most drugs in the U.S. are consumed by the older population who will not be too quick to change their habits, if at all. All in all, I'm satisfied with the qualitative aspects of the story. 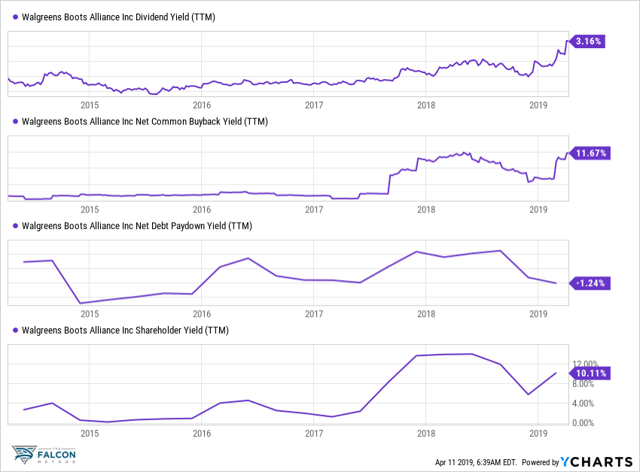 I have been a Walgreens shareholder since 2017, and I increased my position after the Q2 report came out. Besides buying the stock, I also sold the put options with the April 26 expiry and $55 strike price for a premium of $150 per contact. This translates to a quick ~2.7% return on the $5,500 capital that may be required to buy the stock should WBA close below the strike price upon expiry. Either way, I didn't see too much risk with this move as I'd be happy to own more WBA shares at these levels. I think there is no reason to rush here since the company's management expects the third quarter of 2019 to be still bad and expects to start showing improvement in Q4. Thus Walgreens stock can stay attractively valued for months. Click here to see for yourself how the steps of the FALCON Method are all backed up with factual evidence and how the underlying factors performed historically. If you liked this article and do not want to miss any of these in the future, please scroll up and click "Follow" next to my name. Disclosure: I am/we are long WBA, CVS. I wrote this article myself, and it expresses my own opinions. I am not receiving compensation for it (other than from Seeking Alpha). I have no business relationship with any company whose stock is mentioned in this article.